I can’t believe someone had the genius idea to make this figure! I know it will be super expensive. Popular Collections is selling it for around $13 and I bet that’s the cheapest place on the Internet. 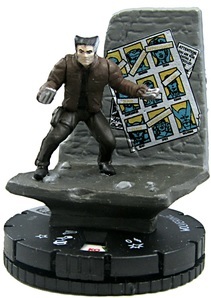 Every so often, I make the mistake of clicking a link I get from that website and I learn that I’m behind on my Heroclix desires by either one or two collections. They are getting better and better with their sculps! Especially if they actually look like that but in miniature form. Back in the day, the pictures always looked far better than the actual item. It wasn’t ideal. Unless it was one of the big name characters. I wish they had added Kate to this one, I know it would have been a twenty dollar Unique figure but it would have been worth it, especially with how it clearly is waiting for someone on that base next to him.